The title of Guster's eighth album, Look Alive, is perfect for this new ten-song collection. Together nearly 28 years, this Boston-bred quartet is very much thriving with fresh ideas and indefatigable energy. As always, Guster has a lot of fun on their latest release with their clever lyrics, catchy melodies, inventive instrumentation, and a slightly askew approach to pop. Look Alive magnifies the band’s trademark sense of adventure and spontaneity. For Look Alive, Guster and producer Leo Abrahams (a frequent Brian Eno collaborator) rely on synthesizers and other electronic effects to create an atmosphere that can be either ominous or cheerful. The album's title track kicks things off in a dark, sinister way with buzzing, whirring, and humming keyboards, meshed with backwards effects that drift in and out like specters. That gauzy fog quickly lifts with the shimmering, squelchy synths and danceable rhythm of “Don’t Go" while "Hard Times" recalls vintage Eurythmics with brightly-treated vocals. “Hello Mister Sun” gradually unfolds as a mini-pop symphony, "Not For Nothing" is just plain dreamy, and “Summertime” simmers with a Monkees or Beach Boys vibe, without really ever sounding like either group. The centerpiece of the album is the quirky “Overexcited,” in which singer Ryan Miller adopts a mock English accent, turning the song into something Madness would have been proud to have in its repertoire. The even-keeled "When You Go Quiet" is a bonus track on physical copies of Look Alive. Guster, at first named Gus, began in 1991 at Tufts University, where Miller, Adam Gardner, and Brian Rosenworcel were all students. The three friends released their debut album, Parachute, in 1994. In the mid-'90s, they fit easily into a scene that included bands like Phish, the Dave Matthews Band, Widespread Panic, and Blues Traveler. In 2003, following the release of Guster's fourth album, Keep It Together, they expanded to a quartet with the addition of Joe Pisapia. In 2010, Luke Reynolds replaced Pisapia. Look Alive is unpredictable and experimental with songs that lodge themselves in your mind in unusual ways. Even if a melody seems impenetrable, it suddenly breaks open, revealing itself in ways not immediately apparent. 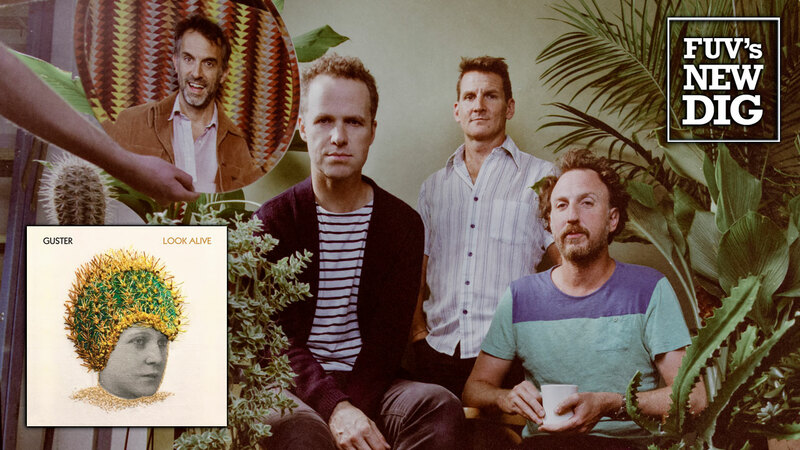 Never musicians who retreat to an easy comfort zone, Guster takes bold risks on Look Alive that not only work, but herald an exciting chapter for this long-lived band. Listen to a new FUV Live session with Guster on Monday, January 28, at 8 p.m. EST, on 90.7FM or streaming online.